For years, my makeup has been all together in one drawer. Recently, I’ve become fed up with always having to dig through all of the make-up to find what I’m looking for and decided it was time for a change. I researched multiple make-up organizing techniques to and found a lot of cute ideas, all that required needing more storage space and quite a bit of money. Since neither of those were feasible, I took a trip to the dollar store and for $2, I was able to get some storage bins that fit well inside my drawer. Now, I’ve got all of my face makeup in the front, brushes in one section, and eye makeup in the others by shape and size. Now I ask, why did it take me so long to do this? It’s so simple and makes my morning routine so much easier! I recently went and bought a vanity organizer because I was also in the same boat, makes my life sooo much easier!! Excellent organizational project and one I need to tackle. That's helpful, and so easy too! Yes, I need to do this so bad! I have tons of make up that I don't necessarily use everyday, but don't want to get rid of either. Need to go get some cute little organizer trays! That definitely makes things way easier! My stuff is all in drawers and it's a total mess, ahha. Cheap enough! I definitely have too much makeup and need to organize. Great ideas. Little containers like that are SO useful for SO many things!! 😀 I like using a drawer for makeup, too, but like the idea of being able to separate different items. 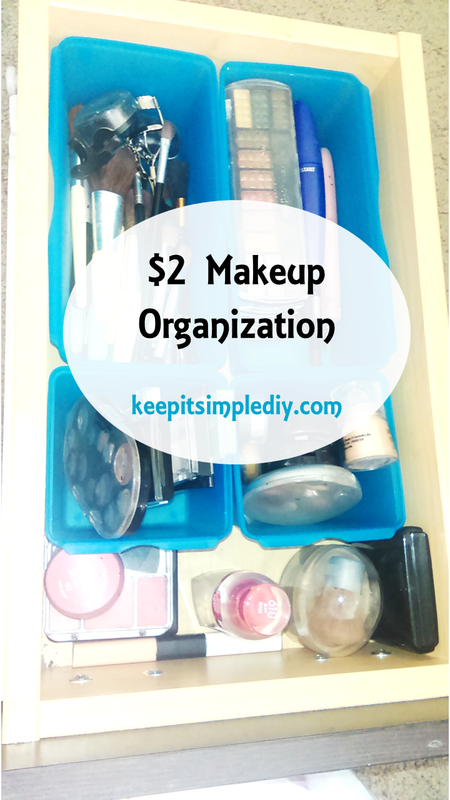 This is a super cheap and easy way to manage the makeup clutter! Love it!